STRAFE Kickstarter, Almost But Not Yet, Help It Reach Its Goal - KABALYERO - PLAY, BLOG & EARN! 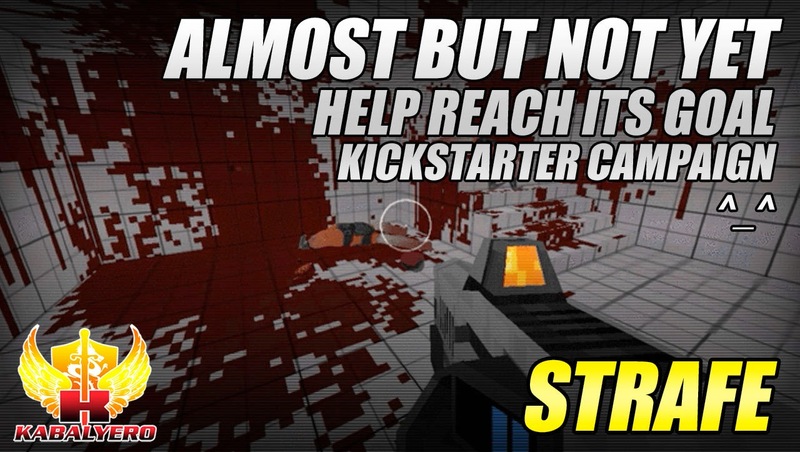 STRAFE Kickstarter is almost at its goal but almost doesn't count and that's why it needs your support. According to its description, STRAFE is the fastest, bloodiest, deadliest, most adjective-abusing, action-packed first-person shooter of 1996. I was able to play the demo briefly and it was indeed fast, bloody and action-packed. It was also kinda lagging a few times and I have no idea why but that's beside the point. The point is this, the game is easy to learn and I had fun playing it. It was only for a few minutes but I still had fun. Now, the developer of the game is currently running a Kickstarter campaign and it will end in less than 3 days. The problem now is this, the goal of the Kickstarter Campaign is at 185,096 dollars and, as of this video, the total pledged amount is at 154,576 dollars. As you can see, the pledged amount is somewhat short by more or less 30,000 dollars. With only less than 3 days to go, you guys can help fund this game making a pledge. To make a pledge, simply go to the game's Kickstarter page. The link is in the description of the video below or just click here.